… if you do not like the CCS concept based on the cascaded Depletion Mode DN2540 N-type Mosfets, … then maybe we could ponder a little bit on the following “cascaded” version, but constructed based on the “normal” Enhanced Mode N-type Mosfets. Make your pick, as long as they can stand the full B+ voltage, the anticipated current and power dissipation. I did not test this circuit yet, but rather wish to discuss it with you. The reasoning of the design is as follows. The lower Mosfet has it’s gate biased from a “fixed” voltage, which is slightly above 1/2 (one half) of B+ voltage, as defined by the voltage divider resistors R4, R9, R3. The capacitors bypassing R4 and R9 are supposed to smooth out the voltage and keep it absolutely DC and absolutely stable, down to fractions of a single Hertz. Per analogy, the upper Mosfet has it’s gate also biased from a “fixed”, but this time, from a higher voltage, about 3/4 of the B+ voltage. The resistors R42 and R2 are gate stopper resistors, so as to avoid oscillations. Their value may be fairly high, so that this way we can hammer down the value of the AC coupling capacitors C7 and C1. These are the capacitors that “feed” the gate of the Mosfets with the AC signal component. The lower mosfet receives it’s signal directly from the anode of the triode. The mosfet gate signal is in-phase with the anode signal. So is the source pin of the mosfet. Hence, R21 maintains a fixed voltage drop and ensures a constant current flowing through the triode. The triode is herewith isolated from the output, and it is the transconductance of the Mosfet that is responsible for ensuring the necessary output current drive and low impedance of the stage. Now comes the cascading bit …. On top of this lower mosfet sits yet another mosfet. You guessed: the “upper” mosfet. It’s gate is also fixed biased, this time from a voltage 3/4 of B+, so that each of the mosfets dissipates roughly the same amount of heat. The AC component for it’s gate is fed via capacitor C1 directly from the output. The “variable resistance” that sits at the source pin of this “upper” Mosfet is the “lower” Mosfet itself, which acts as a bridge, so as to couple the two active devices and enable them to work in tandem. Essentially, the two help each other out. Such a setup results that this “composite” device pair exhibits a composite transconductance that is way, way higher that the transconductance of a single mosfet. You may wonder how come the bias resistors R1 and R27 have such high values. Well, the simple answer is: Why Not? Their soul purpose is to provide a bias, a DC polarity reference, to the gates of mosfet devices. These gates, practically speaking, do not draw any current at all. So we can go sky high with these bias resistors and get away with it. The advantage of going sky high with them is that we can then use a smaller value of the AC signal coupling capacitors C1 and C7. It is much easier and much cheaper to purchase a high quality, high voltage signal coupling capacitor, if it is of only but a fairly low capacitance. So that is exactly what I done. Returning to the function of the upper Mosfet: it also isolates the circuit “down below” from any ripple that may originate from the power supply. Below the upper mosfet there is no ripple anymore. Hence, the lower mosfet is operating very much isolated from the nasty power supply, and is free to concentrate on the AC-specific job that needs to be done. You could ask: “..But what about the ripple getting through via the voltage divider and the gates?”. No problem, believe me. The current flowing through the divider network is close to nothing. The resistor values are huge. Therefore, even a seemingly medium sized bypass capacitor, even an MKP, for that matter, will provide lots of good filtering and a stable DC bias for both of the Mosfets. The cascaded version of such a CCS has yet another feature: it also alleviates the exceedingly high gate capacitance of the mosfet devices. 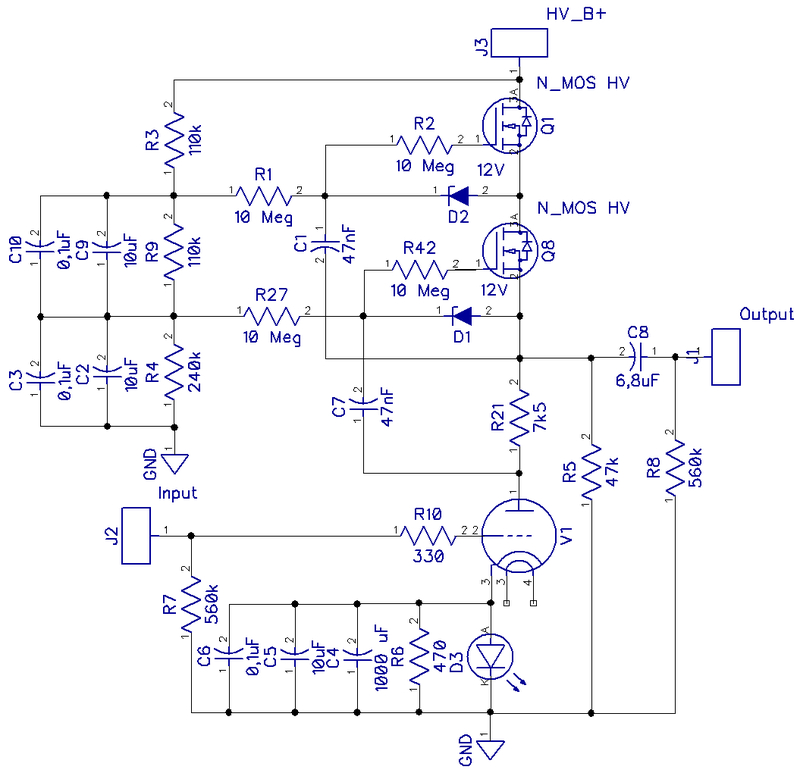 Working in such a configuration, the high gate-to-source capacitance is essentially harmless. The cascaded configuration boasts high bandwidth operation. And what about the Zener diodes? These provide a limit for the polarity between the mosfet’s gate and source, therefore taking care that we do not fry it prematurely. Most Mosfets should be capable of handling gate-source voltages of up to 20V, so the 12V zener seems reasonable. Apart from that, with a 12V polarity, we can get better overall performance of the circuit, operating the mosfets at a higher current, and hammering down the output impedance on the go. The R5 resistor shall run hot, it needs to be of a reasonable wattage. It is supposed to bypass the tube, DC-wise, and pre-bias the mosfets with a higher current, a current than is higher than the one that the tube would accept, or “sink”, if you like. Using the R5, we have the freedom to “program” the DC operating point of the mosfets, independently of the triode current, the one that we may wish to “program” otherwise. A different current flowing through the tube and through the mosfets. B.T.W, … how do we normally program the current flowing through the triode? Some of you would say: “That is obvious, … by using a cathode resistor…”. What if I were to tell you, … that you can use a cheap RED LED, and get away with it? That when using the LED, instead of the resistor, you can actually obtain a similar result as with the resistor, but that the AC impedance of the LED will be close to nothing? With a reasonable current flowing, say in the range of 10 mA, the dynamic impedance of the LED in such conditions is less than 2 ohms. This would imply that you get for free the close to full possible gain of the tube, WITHOUT the need for bypass capacitors. So if you do not like the Cathode-Bypass-Capacitor detrimental sound signature, or “footprint”, as some may call it, you can trade it in for a LED ( .. albeit at the cost of slightly higher overall total harmonic distortion, which is not critical, as far as my practical listening tests, that I have conducted, are concerned). OK, so let’s assume that we put in the LED. The LED holds a constant voltage. So what about the bypass capacitors? We seemingly do “not need” them. But since we do not need them … (sic!) …. Let’s USE them. They shall, in theory, have nothing to do, as the (bias) voltage on the LED is always constant. Having said that, I will leave them there, just the same. It is not a high price to pay ( … In theory, there is no difference between theory and practice. In practice – there IS !!! …). Basically, you have the option to use either a reasonable value of the cathode resistor, or a LED, … or …. both, but that is yet another story. The resistor (pot?) bypass may come in handy in all those cases, where you cannot find an exact “pair” of LED’s, with exactly matched conduction voltages, for your left and right channel. the discrepancies may also be attributable to differences in a less than ideal pairing of the triodes themselves. Try it. You only need to find a closely matched pair of LED’s, that have a forward conduction voltage that is inline with the bias voltage that you need. This may require some hand selection out of a batch-full of LEDs, … but hey, they are cheap as dirt. So feel free to give it a go. 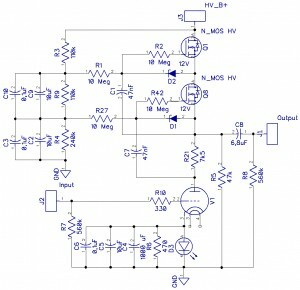 But my question to you is as follows: Will this circuit “Sing” ? Build it. Test it. If need be – tweak it and correct it. Then provide me with feedback as to what you discovered.